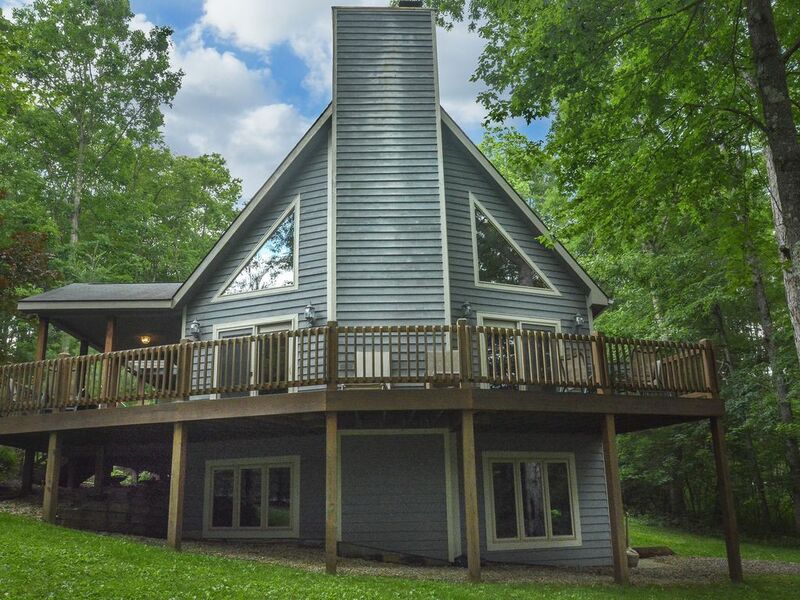 American Pride is an inviting 5 bedroom 3 bath chalet nestled among the trees in one of the most requested communities in Deep Creek Lake. A few steps into the home and you will find yourself entering into the elegantly decorated Great Room which features large cathedral ceilings, a massive stone fireplace, and wide open windows that allow nature to filter gently through. The open and spacious floor plan then flows into the dining area and a kitchen that will surpass your expectations. This state of the art gourmet kitchen boasts stainless steel appliances and more than ample counter and cabinet space to make each dining experience a pleasurable one! A full bath and 2 beautifully decorated bedrooms with queen sized beds are also conveniently located on the main level. On this level you will also be able to set outside onto the expansive wraparound deck via your deck access. The upper level loft houses a double futon, perfect for the kids. Guests of the attached Master Suite will sleep soundly in the king sized bed or they can enjoy a soothing dip in the oversized jetted tub. Head to the lower level Family Room where you can curl up in front of a crackling fire while resting on the plush leather sofas, watch a Blue Ray DVD on the flat screen TV, or challenge a pal to a playful game of billiards. On this level you will also find another full bath, a convenient laundry room and your last 2 bedrooms. Each bedroom throughout this well appointed home offers a unique "Pillow Menu". When it is time to rest your head, choose from a variety of custom made pillows that range from soft to medium/firm. Additionally, every bedroom features luxury bedding and flat screen TVs. The fun continues to flow outside of the home where you and your guests will share stories around the outdoor fire pit or engage in a challenging game of horseshoes. Located under a covered gazebo you will find your steamy outdoor hot tub, an ideal way to unwind in the evening. Spend each morning enjoying the 5 miles of hiking and biking trails that weave throughout the woods located close by or take a short trail to your community dock slip where you can spend hot days swimming, fishing, or docking your boat throughout your stay. A plethora of community amenities are waiting for you whether you and your family use the tennis courts, basketball courts, take the kids to the playground or spend the afternoon in the large heated indoor swimming pool. American Pride is truly one of Deep Creek's premiere pet-friendly homes. Deep Creek Lake is calling your name. Call today for more information on reserving this wonderful home. For your convenience, this home offers free wifi. Access to 5 miles of hiking and biking trails, community basketball & tennis, 7 TVs, 7 DVDs. Brand new outdoor firepit and horse shoe pit! We had a great time. Upon our arrival everything was clean and when we checked out we left it the same way. I would highly recommend this property to someone else. We had a wonderful week at American Pride. The house was well outfitted for our needs. The private hot tub was nicely located out back in a gazebo. The horse shoe pit was nice as well as the firepit (corn hole was nice too although bags were missing-- they quickly replaced them for us when we reported it). Short walk to the dock where we kept a boat for a few days. Wish there was a common area or small beach/water entry point near the dock. Used the tennis courts and basketball hoops. Very nice, private neighborhood for walking dogs. We spent a week with our whole family gathering. Deep Creek was a great location central for everyone out of town making travel easy. American Pride provided enough space for all 15 ages 3 to 89 to gather, play, and enjoy our time. If the weather had cooperated out trip would have been better with more time in/on the water. Thanks, Lynn! We are so happy that your entire family enjoyed their time at American Pride. This is a great home in a great community. We do hope that you come see us again soon! We had 8 adults and there was more than enough room. Every room was very clean, all spaces were kept neat. Highly recommend this property. Water did have a potent sulfur odor. Thanks, Jennifer! So glad that the house worked for you! I will send maintenance out to check the water, we really appreciate you letting us know! Hope to see you again! The following dates have a 3 night stay minimum requirement: President’s Day, Memorial Day, Fourth of July, Labor Day, Thanksgiving, and New Year��s Eve. 3 Night Minimum required in June-August for all homes that allow partial weeks. Lake front and lake access homes require a 7 night minimum stay 6/8/19-8/26/19. Rates and amenities are subject to change without notice. You must be 25 years of age or older to rent a property with Taylor-Made.